Among hearing aid manufacturers, Zounds Hearing has a unique story. Engineer Sam Thomasson had already created Acoustic Technologies, Inc. to improve sound quality in a variety of communication systems such as cell phones and conference calling, before founding Zounds Hearing in 2005. Motivated by his daughter’s hearing loss, Thomasson was driven to create hearing aids that adjusted automatically and more easily to changing environments and individual needs. Unsatisfied with the current market, Thomasson used his experience with calling communication systems to create state of the art hearing aids. Claiming 52 patents, Zounds Hearing makes aids that are just as unique as their origin. While most hearing aids only account for up to 5,000 Hertz, Zounds hearing aids reach up to 8,000 hertz. This allows users to hear even higher pitched sounds and better distinguish between ch, t and s sounds to increase overall understanding. Their technology also does away with the telecoil. Instead, they use an electronic mechanism to eliminate squeaky feedback sounds. Hearing aids come in four different digital models, three of which are rechargeable and come with remote controls. You can choose between a foam sleeve or dome tip to place in the ear. People who receive Zounds’ hearing aids like being able to hear the television, radio and grandchildren’s high pitched voices. Specifically designed to outperform other hearing aids in high pitched frequencies, it’s no surprise many find speech clearer with these hearing aids. To top it off, they offer a minimum 30 day trial period with a money back guarantee. Aside from the ability to recharge many of their hearing aids and innovative technologies that make listening intuitive, low prices also make Zounds a more affordable choice. 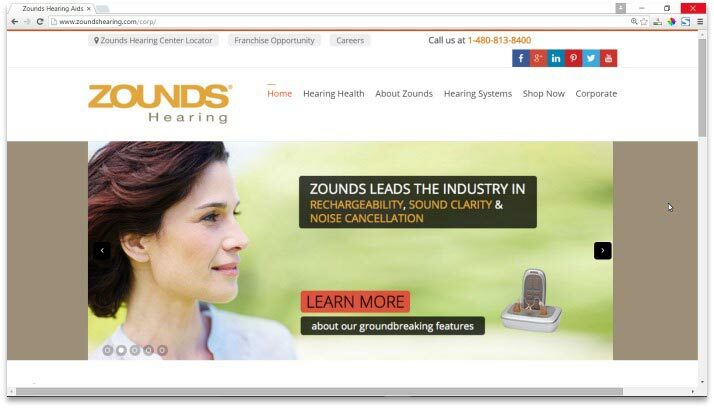 Zounds Hearing explains that prices are competitive because the feedback cancelation technology and fitting tip options mean the hearing aids themselves do not need to be custom made. Prices are also reduced because they are not sold through third parties, only at corporate or franchise locations. Despite these benefits, Zounds Hearing only has 182 outlets found in 32 states, making finding a local store a bit complicated. Even if there is a store near you, if it were ever to close, finding another location nearby that services your hearing aid might be tricky, which has happened to some customers in the past. Accessibility is a big issue, especially if problems arise. This limitation holds back Zounds Hearing from outcompeting other big brand names. Zounds hearing aids reach up to 8,000 hertz which allows users to hear even higher pitched sounds and better distinguish between ch, t and s sounds to increase overall understanding. Zounds may be an up and coming name. With only ten years in the industry, its hearing aids and offices have made a significant expansion and are continuing to grow. People who have Zounds Hearing centers nearby are often happy with the results and service. The problem arises when stores close down or someone moves. However, the current inaccessibility should cease to be a problem as the company continues to grow.